The bench where Hanks’ Oscar-winning, slow-but-special Everyman pondered life. Sometimes life gives you…a messy, overgrown famous square that no longer feels quite safe? That’s the case in Savannah, where the square where Forrest Gump sat on that bench of his is getting a long-overdue makeover. 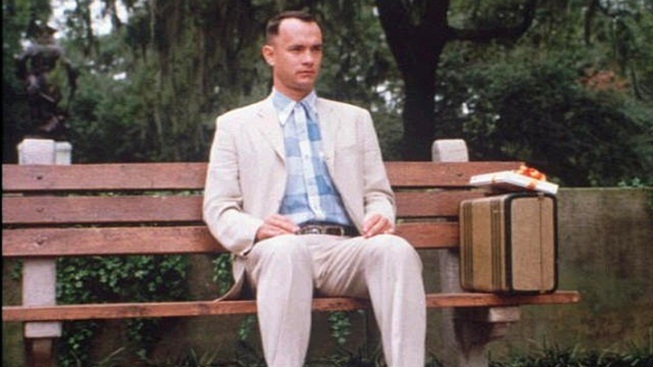 On Monday city crews began clearing undergrowth and cutting away dead tree limbs in Chippewa Square, the place where Tom Hanks, as Gump, dispensed wisdom such as “Life is like a box of chocolates” while waiting for a bus, the Savannah Morning News reports. One major problem: the azaleas that were planted up to four rows deep around the square grew to about 12 feet high and 8 feet wide over the years, so "homeless people frequently crawled into the underbrush for extended stays, and were known to approach people in the park,” according to the paper. Garbage also tended to gather there. The out-of-control azaleas will be trimmed to one row about 3 feet high, and some smaller magnolias and palm trees will also be removed. But more than 100 new azaleas will also be added around the rest of the square to bloom in spring, along with camellias, gardenias, hydrangeas and “fragrant tea olives” for other seasons. The $80,000 project should be done in two months. But if you take a trip down South, don’t look on “Forrest Gump’s square” for the bench where Hanks’ Oscar-winning, slow-but-special Everyman talked and talked. It’s not there, but in the Savannah History Museum, eight blocks away.